This page contains all the Petals & Patches 'Nature's Gifts' patterns available for you to purchase. Any picture may be enlarged for greater clarity by clicking on it. All 'Nature's Gifts' can be purchased via our secure shopping cart, or alternatively you can mail your order to us. We ship your order via surface mail within Australia or airmail outside Australia. As a guide to probable shipping costs there is a table here that details the pattern shipping costs within Australia or to New Zealand, USA or UK. We have a catalogue of all our patterns and kits that is available for posting to you. E-mail us to request your copy. Our blog will give you a more up to date description of what we are currently doing and our plans for the future. 1. If purchasing as a BoM you will receive each month, a pattern starting at no. 1 and concluding with the 7th (and final) pattern. 2. If purchased as a complete set you will receive all seven (7) patterns in a single delivery. 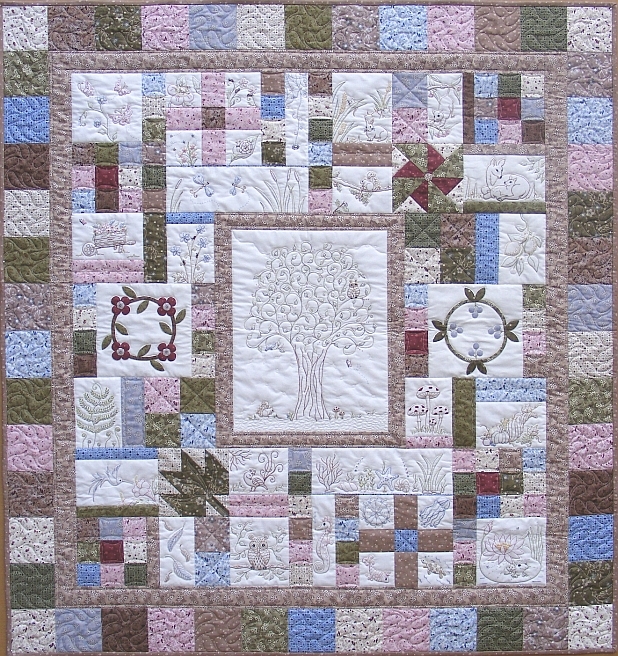 The full Nature's Gifts quilt set comprises 7 individual pieces that together make up the quilt. This quilt encapsulates nature, from the birds of the skies to the depths of the ocean floor. This sweet quilt features simple and easy stitchery & appliqu� designs. These stitchery and appliqu� designs can be used in a variety of other applications, i.e. bags, cushions, etc.